Something new, something old. This is a new style that I'm trying out which is similar to the work done in the Rectangular centerpiece, but with multiple swirls. 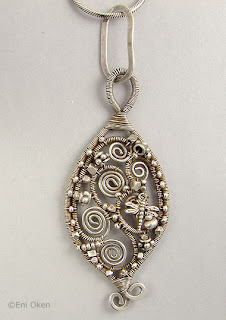 The result looks like filigree, but like all of my work, there is no soldering, only wire wrapping. 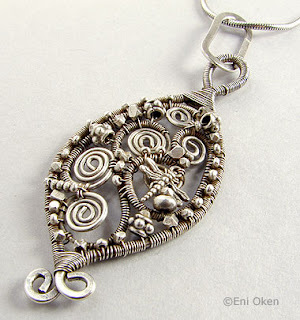 I made a very similar pendant last year for my trunk show, but that one is gone. I figured I'd make another one and I would like to let this style develop a bit more -- I think the resulting piece is pretty flat but interesting.